I got the new fittings and hoses hooked up then flushed the water chiller and the induction heater. No leaks, cooling is a go! Before putting it back on the cart I replaced the top plastic liner with 16 gauge sheet metal that I cleaned and lightly wiped down with oil. I think I’ll go back and add a lip around 3 sides with the box break to catch any falling sparks and molten beads of metal that try to escape. And here it is with cooling set up on the new cart. Now to move on to power. I am making a quick disconnect near the breaker box. I will need to draw and 3D print a small enclosure for the 3/8″ dual splicers. More on that progress here. Hooking up cooling water, but first, fittings! One trip the hardware store later and I’m ready to hook utilities up to the induction heater. Hooking up cooling water isn’t the only step… Power! I also ordered a larger variac, a 5000VA 220V model to aid in testing and firmware optimization. I have a small 2000VA 120V variac but running it on such low voltage skewed a lot of the readings. The variac is nice because running full power while testing new features can a bit nerve-racking and wasteful. The Reactor Forge on the Bench and ready to hook up! This new rolling stand from SAMs club was perfect for holding the Reactor Forge, Bernard Weldcraft 3 gallon water cooler, extra bricks, and coils. I just need to replace the top plastic insert/mat with a piece of sheet metal. Publish existing mechanical specs, unit wiring schematic, core control board schematic, to Atmel C code to Github. Add my current issues and changes that need to happen to each of the above topics in Github for proper tracking. Work on those issues, changes, and improvements. Make the next version, test, refine, and repeat as needed. Work on BOM supply chain. 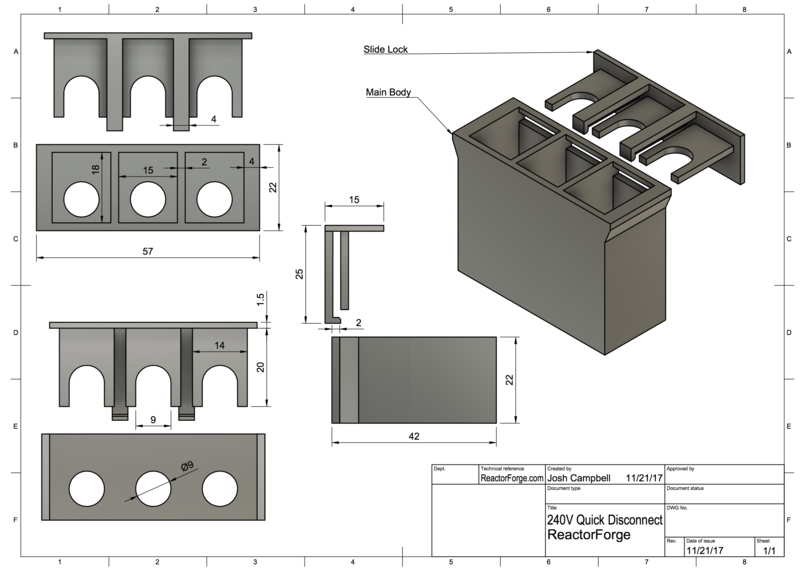 Kit logistics: work on which parts will be preassembled and which will require user assembly. Create and publish a kit manual. What’s next after getting the Reactor Forge on the Bench? Hooking up cooling water and power. This project is moving forward regardless of Patreon backing. However, any support will be a great motivator as well as help with the time, money and effort required for this project. The ReactorForge open source induction heater is my way of giving back to the maker community so Patreon or not I hope you find use in this work! For anyone who has ever wanted to make a homemade induction heater that goes beyond being just a novelty, the DIY kit and plans will be your ticket! A couple of years ago I had considered doing a Kickstarter campaign to fund making a small/medium batch of induction heater kits, but I have seen and studied the downfall of many similar projects attempting to use crowdfunding to accomplish the same goal. I won’t underestimate it, this is a complicated machine with lots of parts, and although I believe I could be successful on Kickstarter, I am choosing to go a different route. One which I think will yield a higher quality product and allow me to better support it. I’ll be making small batches and selling them based on a waiting list similar to how a well known, successful maker of an excellent gas forge operates. For some years my brother had a small blacksmith shop where he mainly made tools for other blacksmiths. He is currently taking a break from it but, like many, he first worked with coal then moved up to using a gas forge. He used a dual burner propane forge exclusively for a while but starting talking to me about the limits in production he hit as a result of waiting on stock to heat in between working it, sweltering summer heat, ventilation issues in the winter, and high propane costs. None of which were preventing him from working or making a great product, but he was feeling the heat. (That’s the only pun I’ll use, promise!) He mentioned how great it would be to have an induction heater. However, the domestic models were too expensive, and the cheap overseas models didn’t have an exceptional track record living up to their 1.21 JiggaWatt claims. Also, any issues with the unit left you high and dry with little to no support or ridiculous shipping and repair costs. Being a typical maker who loves a challenging project with an atypical way of creating multi-disciplined solutions I told him I’d look into it. After combing the internet for examples and inspiration as well as using what I already knew, I threw together a proof of concept that worked for a few minutes then went up in smoke. I saw the potential and knew I could do better, so I redesigned a couple of times, used better components and about six months later had a unit cobbled together in an old computer case that was good enough to run 100% duty cycle with water cooling from a garden hose. He used it for a week and never fired up his propane forge again. Each heating method certainly has its strengths and weaknesses but the induction heater better fits his needs, and it opened up a lot of possibilities. He significantly increased his production output and earning and was able to build a bigger shop, all centered around that one machine. Over the next couple years, I redesigned and refined a few more times, making the unit more powerful and more reliable. The induction heater I have today is a beast and is much more than I ever expected. Aside from its power, I’m excited about its reliability. The original unit was in an open computer case exposed to all the shop elements including that black sticky metallic dust that gets everywhere. You know what I’m talking about if you’ve worked with metal on any level. My brother pushed his induction heater is ways that made me cringe while watching. I resisted the urge to tell him to ease up because I wanted him to drive it to failure and that he did many times. Every time I repaired it, modified the design and improved the components. Back and forth we did this until now, the unit sits there and just works regardless what he does to it, for years now. That level of reliability is perfect for me because I don’t want only to be a customer support specialist. Downtime and trying to fix problems remotely is just no fun, so I don’t want to make something that is going to put me in a nightmare job position! I’m using quality components, a sturdy sealed enclosure, code to detect and prevent failures and I believe I will still be able to sell this around the cost of the inferior overseas models. I wish the kit form of the ReactorForge were ready now, not because I need to or want to make money off it but because I’m excited at what it will do for all the hobbyists and makers who can use a machine like this. Think blacksmiths, bladesmiths, metalsmiths of all kinds, glass melting, scientific uses, etc. the applications are vast. Thank you all so much for your support, and I can’t wait to be working together soon! ReactorForge is an open source high power induction heater platform. Special thanks to the people of I Forge Iron and 4HV!